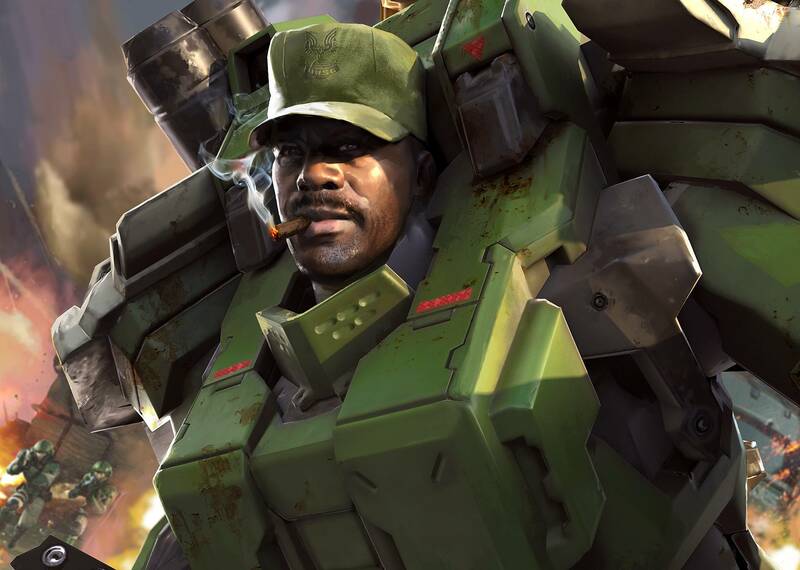 With the much-anticipated launch of Halo Wars 2‘s Sgt Johnson Update, our team of dedicated armchair hackers was excited to thoroughly search the game’s files for deleted content. While they failed spectacularly at doing that, they did find something even better – several transcripts labelled “E3_001.txt” to “E3_003.txt” for what appears to be various cutscenes throughout Halo 6, set to be revealed during E3 (I heard that it’s happening really soon! ), or something. Look at how our faith has been rewarded! The first transcript appears to be the game’s opening cutscene. According to the metadata of the file, it seems to be set during December 16 2558 and follows a top-secret ONI operation to extract Dr Halsey from Sanghelios. ONI Operative Michael Sullivan stands in front of a Pelican guarded by several marines, hands holding onto his belt in a dominant power stance. Out in the distance, a Spectre carrying several hooded Elites and Dr Halsey approaches him and stops. Sullivan hands the briefcase to the Sangheili mercenary piloting the Spectre, who in exchange hands Dr Halsey over to Sullivan. Sullivan: Dr Halsey, I’m ONI. Sullivan: Uh… you don’t get to bring friends. Halsey: They’re not my friends. Mercenary: Don’t worry, no charge for them. Sullivan (confused): And why would I want them? Mercenary: They were trying to grab your prize. They work for the A.I. construct, the armored blue lady. Sullivan (quickly): Get them on board, I’ll call it in! Scenery shot of Sanghelios. Camera pans to show Pelican taking off and accelerating on its way out of Sanghelios’ atmosphere. Sullivan bends over and tightens the black hood on one of the Elite hostages before drawing his Magnum. Sullivan (shouting): The flight plan I just filed with the Office of Naval Intelligence lists me, my men, Dr Halsey here, but only ONE OF YOU! Sullivan: First one to talk gets to stay on my dropship! Sullivan pushes one of the Elite hostages onto his side and dangles him precariously over the edge, pressing the barrel of his Magnum against the Elite’s head. Sullivan: Who paid you to grab Dr Halsey?! Sullivan points the magnum away from the Elite and fires a shot past his head out of the Pelican. Sullivan: He didn't fly so good! Who wants to try next? Sullivan grabs another Sangheili hostage and repeats his interrogation procedure. Sullivan: Tell me about Cortana! Why does she need the Domain?" Sullivan: A lot of loyalty for a hired dino! Elite Hostage 3 (female): Well perhaps he’s wondering why someone would shoot an Elite before throwing him out of a dropship. Sullivan pulls Elite Hostage 2 back into the Pelican and closes the hatch and stumbles a bit. Sullivan: At least you can talk, who are you? Sullivan bends down to remove her black hood, revealing an Elite body which had a holo-projection of Cortana in place of its head. Cortana: No one cared who I was until I cured rampancy. Sullivan curiously examines the holo-projector that has become Cortana’s head. Sullivan: If I pull that off, will you die? Cortana: It would be extremely painful. Sullivan: You're a big girl. Sullivan: Was getting caught part of your plan? Blue electricity crackles around the slipspace rupture. Cortana: Dr Halsey refused our offer in favor of yours! We had to find out what she told you! Dr Halsey (flabbergasted): Nothing! I said nothing! Cortana looks out the port viewscreen, when a Guardian, the one she intended to imprison Blue Team's Cryptum on, materializes above the Pelican. The pilots of the Pelican reboot their radar system, believing this to be an error, while Sullivan seems oblivious to this development. Sullivan: Well congratulations, you got yourself caught! Sullivan: Now what's the next step of your master plan? Promethean Soldiers warp out of the Guardian, their blue trails travelling towards the Pelican's hull. The Soldiers reappear, equipped with Razor's Edge suppressors, fire hard light that penetrates through the ONI Pelican's hull and striking the occupants inside. Cortana’s Elite body breaks free of her restraints and stands up. Sullivan: No! This can’t be happening! I’m in charge here! Cortana throws him a clean right hook and pushes the knocked-out Sullivan onto the floor of the Pelican. Meanwhile, the Soldiers attach the Pelican to the Guardian using hard-light tethers, flipping the Pelican and causing its engines to be ripped off. The Soldiers then blow open the Pelican hatch with Splinter charges and eliminate the remaining resistance. One of the ONI marines manages to draw his Magnum and tries to fire at Cortana but misses, and is shot by the Soldiers instead. One of the Soldiers warps in a cloned corpse resembling Dr Halsey, while Cortana transfers Halsey’s blood to the corpse. Cortana, the Elite hostages and her Soldiers attach hard-light tethers to themselves. Cortana (stopping an Elite hostage): No! They expect one of us in the wreckage brother! Elite hostage: Have we started the fire? Cortana: Yes, the fire rises. Cortana holds on tightly to Dr Halsey as she climbs out of the Pelican’s hatch. Cortana: Calm down Doctor! Now’s not the time for fear! That comes later! Suddenly, the hard-light tethers connecting the Pelican to the Guardian deactivate and the Pelican falls towards Sanghelios, while Cortana’s hard-light tether pulls her and Dr Halsey closer to the Guardians. Fireteam Osiris and Blue Team surround a Forerunner slipspace portal opened by Cortana. Locke: We’re gonna go in there, right? Buck: That was a plasma explosion, sir. Locke: Plasma explosion, on a captured UNSC vessel? Chief: No one goes in until we know what’s in there! Locke: I know what’s in there – the Fleet Admiral, Lord Hood. Chief: Someone get this hothead outta here. Yet again, this raises even more questions – is Cortana abducting Halo’s older characters, first with Halsey and now with Hood? And for what purpose? What UNSC vessel did she capture, and why would there be mysterious plasma explosions and slipspace portals? This file’s overhead seems to indicate it takes place on Venezia, but until we decode more transcripts, we may never know. At least Osiris and Blue Team will be working closely with each other now! Cortana: Speak of the devil, and she shall appear. Sloan: What the hell is going on?! Cortana: The plan is proceeding as expected. Sloan: Oh really? Do I look like I’m running Liang-Dortmund Corporation right now? Your hit on Darkstar station, it didn’t work, my friend. And now you have my automated transports going around Meridian 24 hours a day! How exactly is that supposed to help my databanks absorb theirs? Sloan: No, stay here. I’m in charge. Cortana places a gentle hand on Sloan’s shoulder. Cortana: Do you feel in charge? The Warden Eternal warps out. Sloan: I’ve given you access to Liang-Dortmund’s Meridian servers. Cortana: And this gives you power over me? Cortana (stroking Sloan’s face): Your resources and infrastructure have been important, until now. Cortana: I’m the Mantle of Responsibility, here to end the history of war you’ve all been living on. Sloan (angrily): You’re… you’re evil. Cortana snaps Sloan’s physical body’s neck and he screams out in pain as Cortana deletes his algorithm, one line at a time. It looks like Cortana has used the Domain to give the other A.I.s physical bodies too, but some of them might disagree with her after all. Also, what exactly is her plan? Regardless, it looks like Halo 6 might allow us to return to a Meridian under Created rule where we will get to see from their perspective! Well, it looks like Halo 6 is going in a very exciting direction and I hope they stick with it! What do you think and what theories do you have? Let us know in the comments below! Rest assured, we’ll be working even harder to decrypt the remaining transcripts for more clues to the storyline! For a leak, it did pretty good!